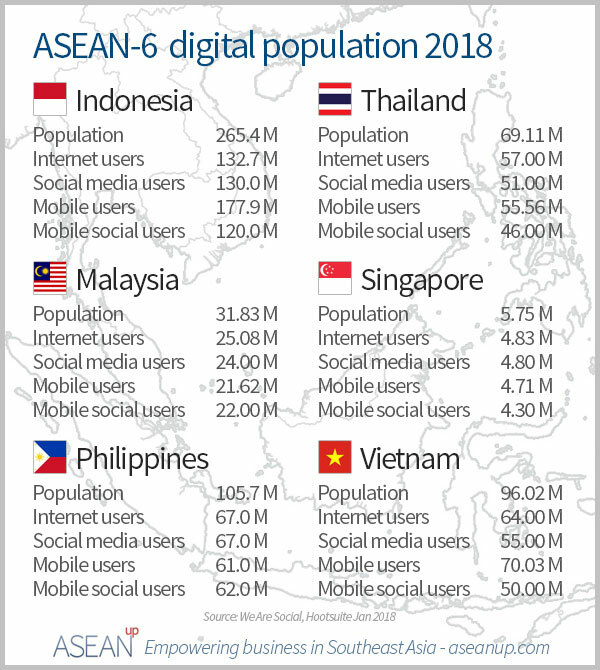 To recapitulate the numbers for the 6 largest countries in one glance, here is a summary of the numbers gathered for ASEAN-6 countries, with total population, Internet users, social media users, mobile connections and mobile social users for Indonesia, Thailand, Malaysia, Singapore, the Philippines and Vietnam. Taken as a single bloc, Southeast Asia regroups a large population of digital users that take it to levels where it can stand the comparison with the leading global markets (US, EU, China…) for all of digital activities: Internet, social media, mobile and mobile social. Such growth should continue on a similar trend for more years to come. The large and growing digital population should help sustain digital business expansion and keep on attracting more and more businesses online, providing new ways for marketing in Southeast Asia and enhancing the fast-growing Southeast Asia’s e-commerce sector.